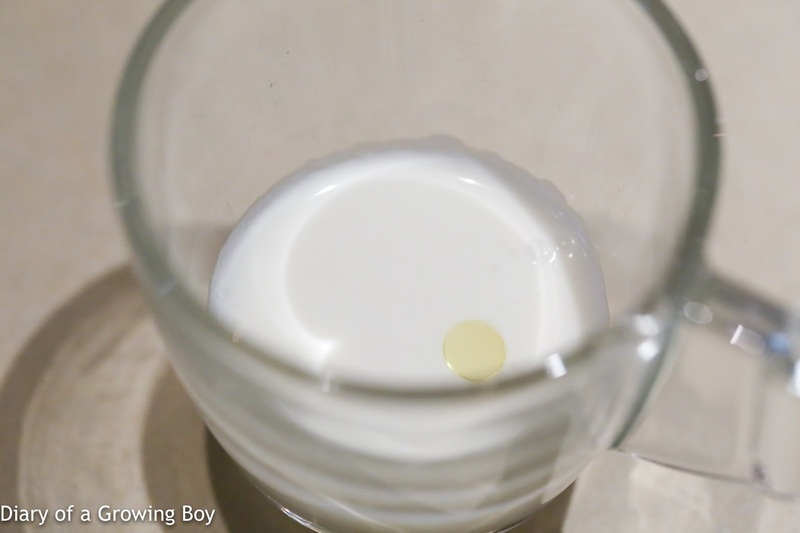 吃喝玩樂 - Diary of a Growing Boy: Bangkok 2017 day 3: Le D'oh! 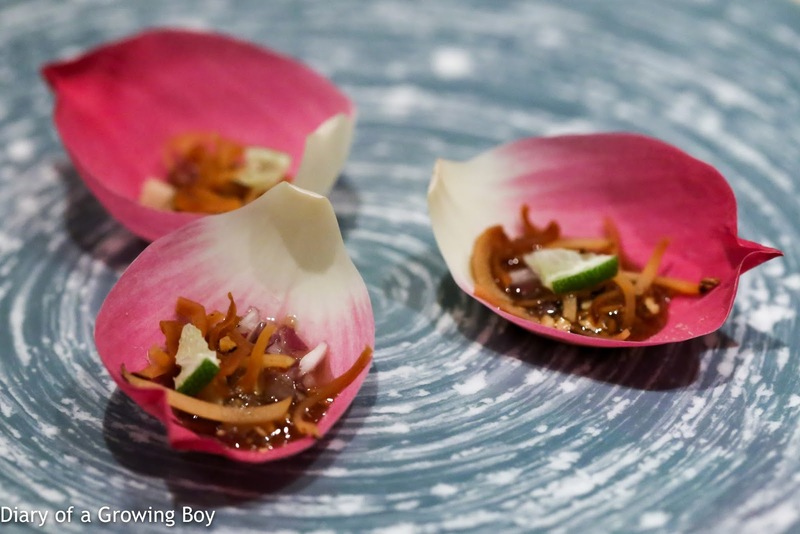 A few of my friends have previously enjoyed their meals at Le Du, and when people talk about fine dining or chefs doing creative things to modernize Thai cuisine, this place often gets mentioned. So when I was choosing a venue for a gathering with friends from New York, Singapore, and Melbourne, this was the chosen one. Of course, it didn't hurt that the restaurant was within walking distance from the serviced apartments where 4 of us were staying. I was rather surprised at the no-frills decor of the place. Low ceilings and bare cement walls. In fact, the place was so minimalist that there was nothing to absorb any noise, so the restaurant was very, very boisterous. We had to up our own volumes in order to carry on a conversation with friends across the table. Not a great ambiance for me - especially when I was expecting (perhaps mistakenly) fine dining on the table. There was never any question that I would take the full 6-course tasting menu, although a few of us did take the shorter, 4-course menu. Tomato soup with oregano salt - very creamy, with thick texture like crème fraîche. Lotus flower with Thai salad - with shredded carrots, chopped ginger, dried shrimp, and lime paste. Kinda like miang kham (เมี่ยงคำ). Poached oyster, chili paste, spicy green mango relish, Thai rice wine sabayon - the thin wafer of rice cracker was deliciously toasty. 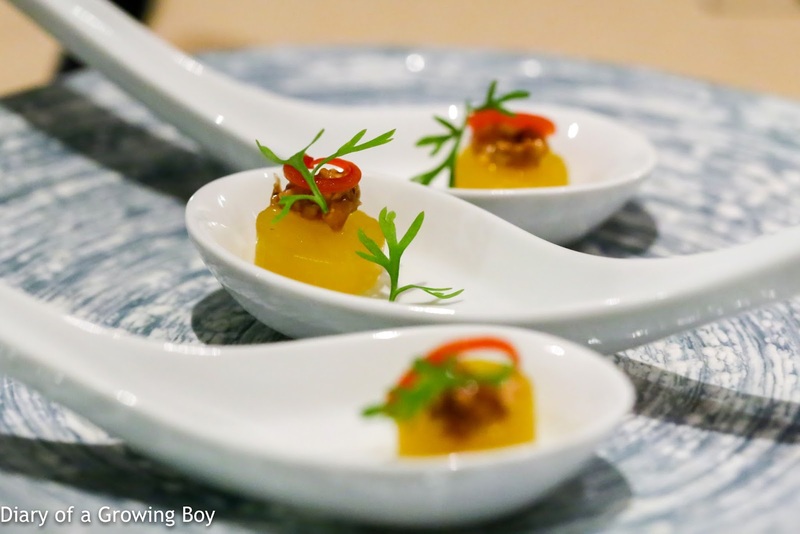 Underneath the sabayon made with sato (สาโท) was a green mango relish with kaffir lime and chili. I liked that there was just enough kick without putting my tongue on fire. 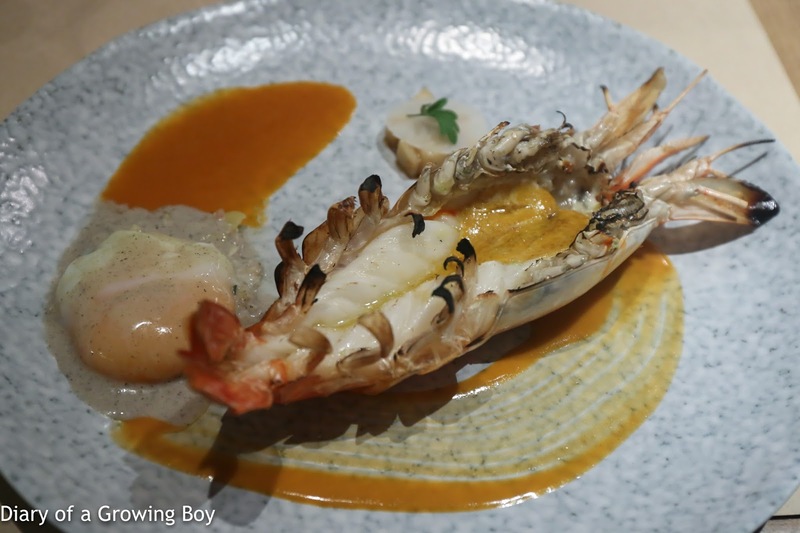 River prawn, egg, chu-chee curry, banana blossom - the poached egg came with burnt lemongrass purée mixed with banana blossom and kaffir lime leaves. The prawn was pretty decent and had a nice amount of tomalley, and came with with chu-chee (ฉู่ฉี่) curry. 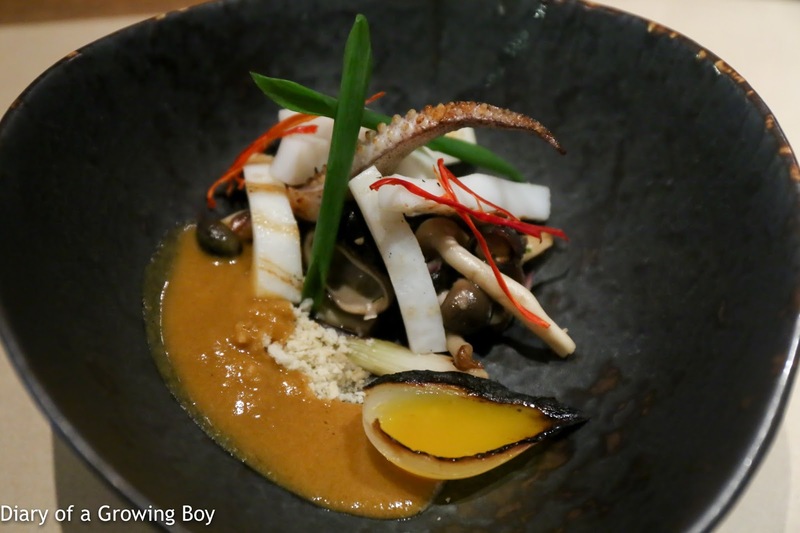 Squid, wild mushroom, salted duck egg - Hello Kitty offered me a taste of her dish. The squid was OK, but the mushrooms were pretty delish. Sustainable ocean fish, roasted pumpkin puree, fermented fish stomach - I don't remember if we were told what type of fish we were eating, but whatever it was, it was very, very bland. I had no issues with the execution, as it was seared around the sides and still a little raw in the middle. But there was absolutely no seasoning, and relied completely on the sauce on the side - made with roasted pumpkin purée and tai pla (ไตปลา) - fermented fish stomach. The greens on the side came with a pretty sweet sauce. Speaking of which, I gotta hand it to the chef. It takes guts to put fermented fish stomach on the menu of a restaurant where farang eat... although admittedly the sauce was just salty and spicy, and didn't taste too pungent. Free range pork belly, green bean salad, Chamuang sauce - FAIL. Pork belly - with all that skin and fat - should have been very, very tender and satisfying. This piece was overcooked, tough, and dry. It gave me no pleasure whatsoever to put it in my mouth. Served with sauce made garcinia (ชะมวง) leaves. Wing bean salad with pickled radish was much better than the pork. 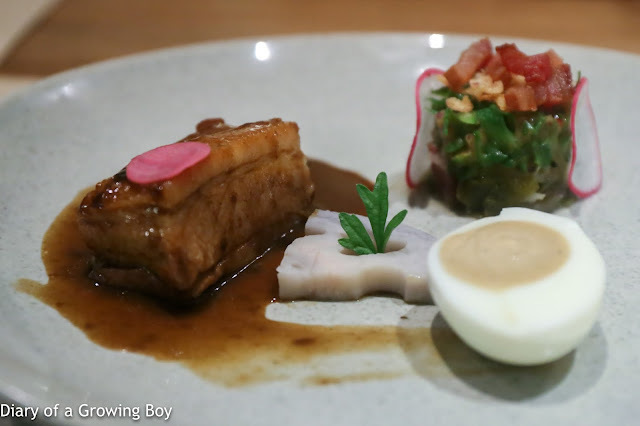 The half of boiled egg on the side had its yolk replaced with fermented fish purée, which was a little savory with umami, a little spicy, and fragrant with kaffir lime leaves. 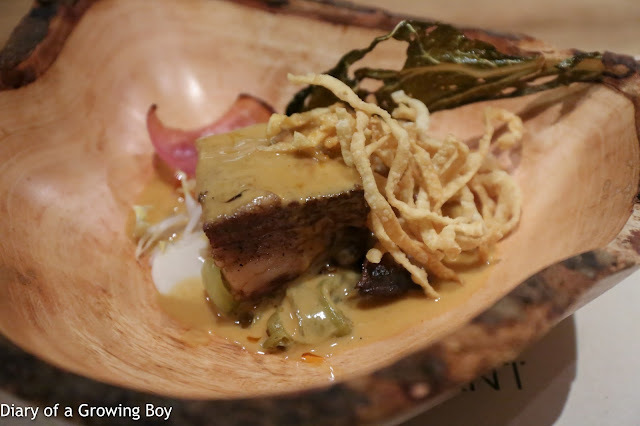 Local short rib, egg noodle, cabbage, home-cooked khao soi - I was lucky to have had a piece of this from Hello Kitty, and it was MUCH, MUCH better than my pork belly. Came with pickled cabbage and pickled bean sprouts underneath, and khao soi sauce on the deep-fried egg noodles. 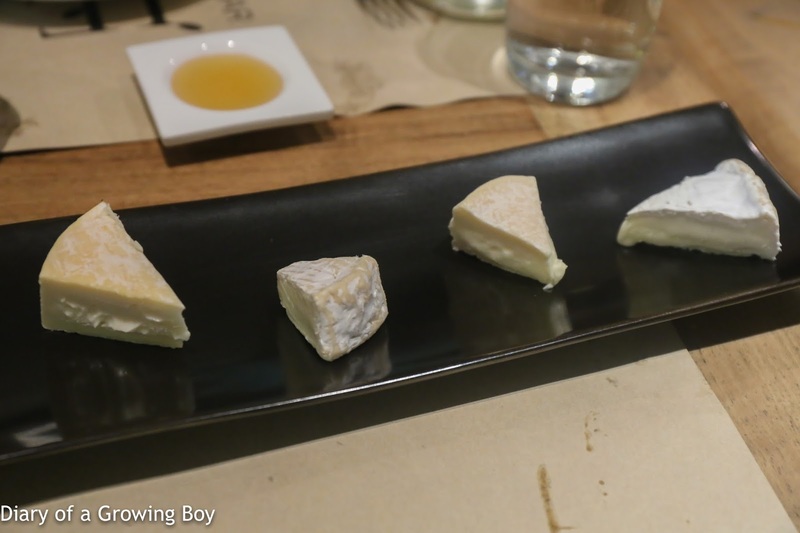 Local cheese - one of my friends has been here a few times and was recognized by Chef Ton's girlfriend. We were given a complimentary plate of cheese made locally - which we suspect came from Heaven on Cheese. We had Reblochon, Camembert, Brie, and Munster. 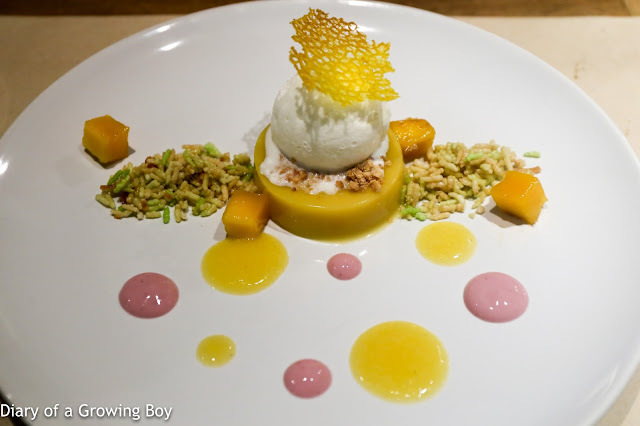 Mango panna cotta, passion fruit, smoked coconut ice cream - this was Hello Kitty's dessert, and it was MUCH better than what I got as part of the 6-course tasting menu. The panna cotta was good, as was the smoked coconut ice cream on top. The puffed sticky rice on the side was interesting, and worked well with both the coconut and the mango elements. The passion fruit and raspberry dots on the side looked pretty, too. 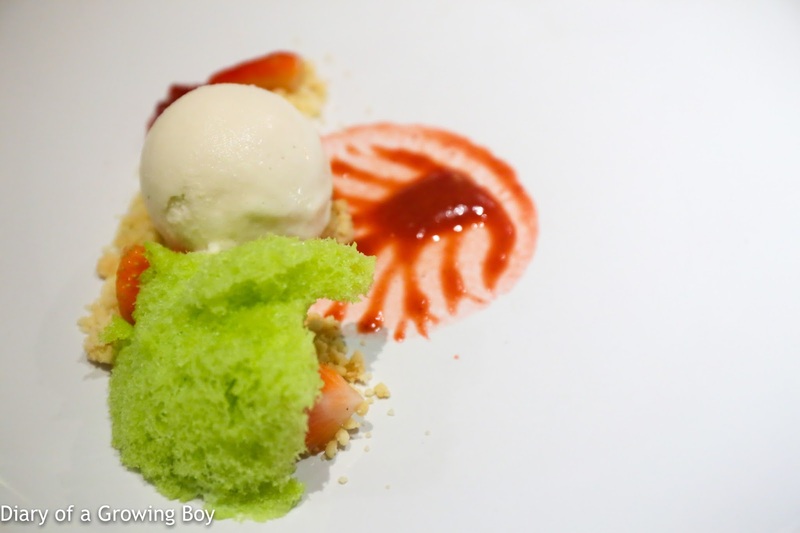 This deconstructed version of the classic khao niew mamuang (วเหนียวมะม่วง) was definitely a hit. 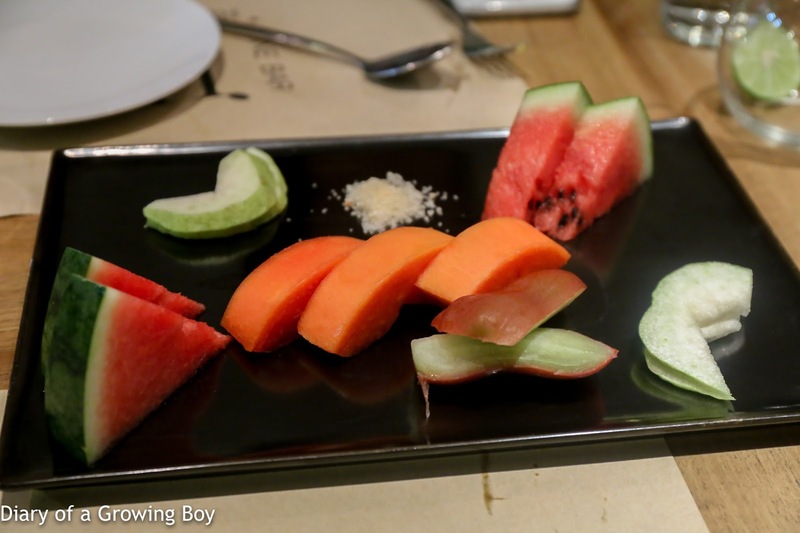 We also got a fruit plate at the end, which was nice. Was this a bad meal? Certainly not. I could see that Chef Ton tried very hard to incorporate traditional Thai flavors into his dishes, and in general they worked. But to be honest, none of the dishes really excited me, and I wasn't the only one who felt this way. For a restaurant that has often been mentioned together with other fine dining establishments in town, and for a chef often cited as a rising star on the local culinary scene, tonight's performance was somewhat of a let-down. 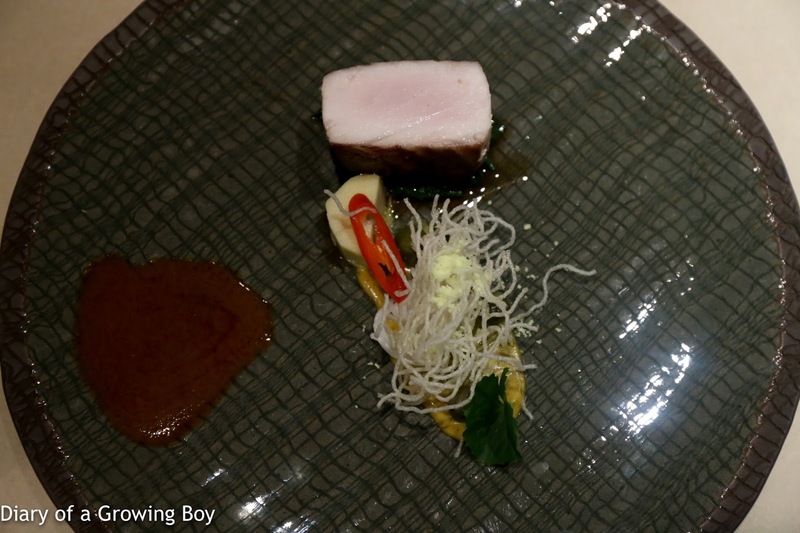 We knew that Chef Ton was away at the Chef's Feast of Asia's 50 Best Restaurants tonight, so perhaps execution was somewhat affected - under-seasoned fish, overcooked pork belly... although the latter is a cardinal sin in my book and really pisses me off.